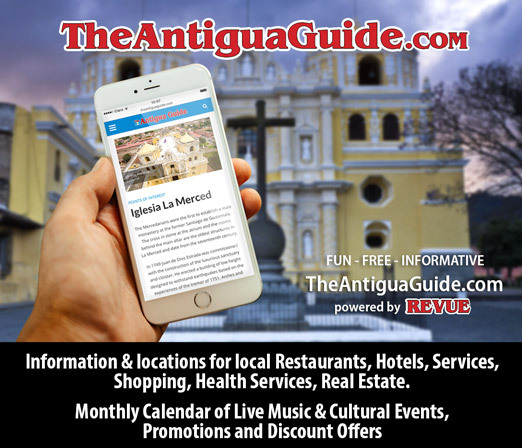 Lidar image technology and a series of National Geographic specials have introduced a growing number of people to the ancient Maya civilization. This book invites in even more readers into the worldview and the mystical realm that reflect the heart of the Maya people. 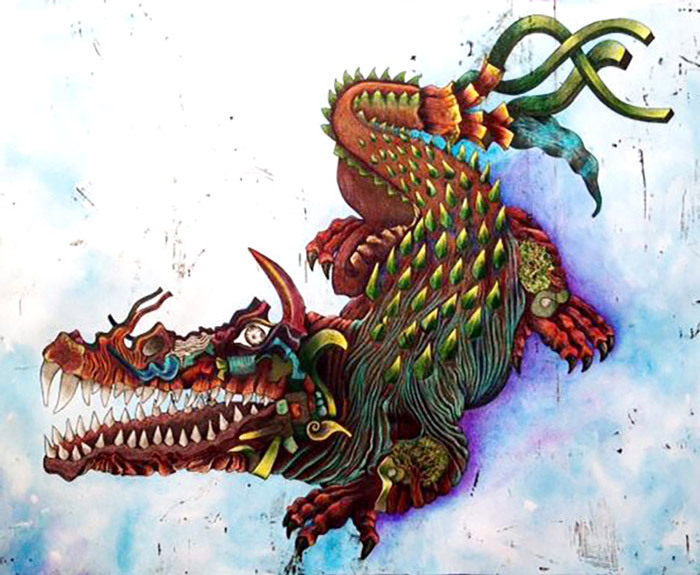 Through captivating stories and exotic illustrations, it also draws upon ancient myths and lore and gives life to their quirky gods. 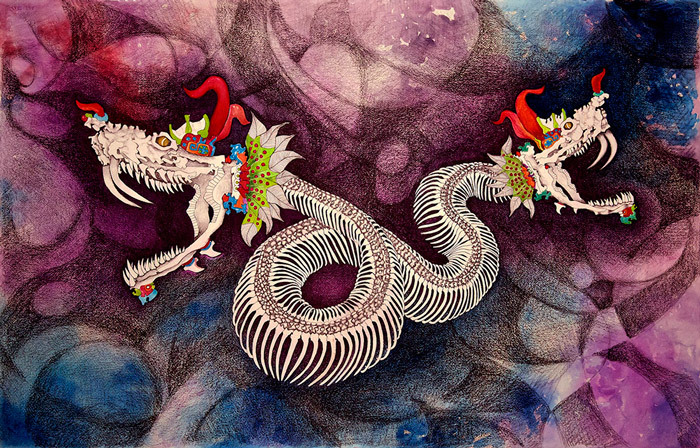 Whitebone Centipede by Alfonso Huerta. 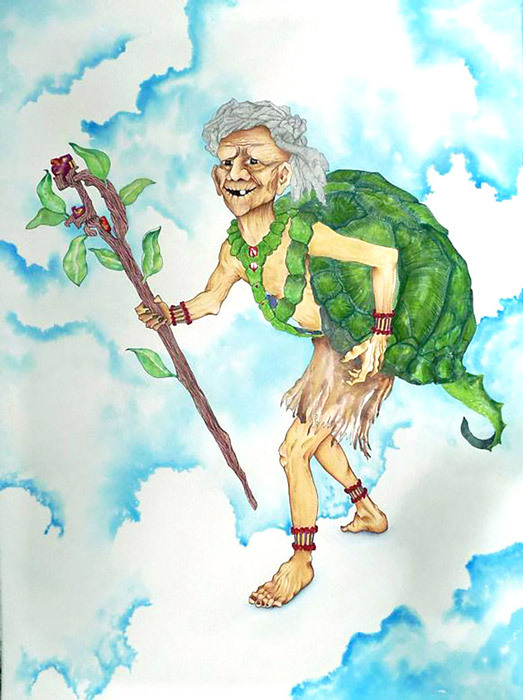 One of the symbols of the Maya is the story about The Water Lily Jaguar. “Water Lily Jaguar swims in the silver rivers of the rainforest. Water Lily Jaguar swims in the silver pool of the moon…” This story is just one of fifteen that blend the natural and the supernatural within the world of the Maya. 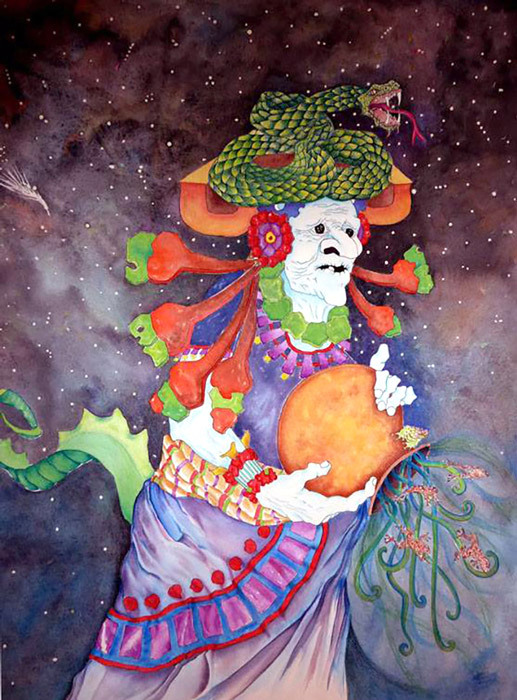 Corn God by Alfonso Huerta. The dreamy figures depicted by Alfonso Huerta help spur one’s imagination while being true to the colorful characters from the mythical Mesoamerican tradition. Huerta is a native of Mazatlán, Sinaloa, Mexico and provides a unique artistic perspective, which blends an awareness of the beauty of everyday objects with surrealism and lush tropical colors. 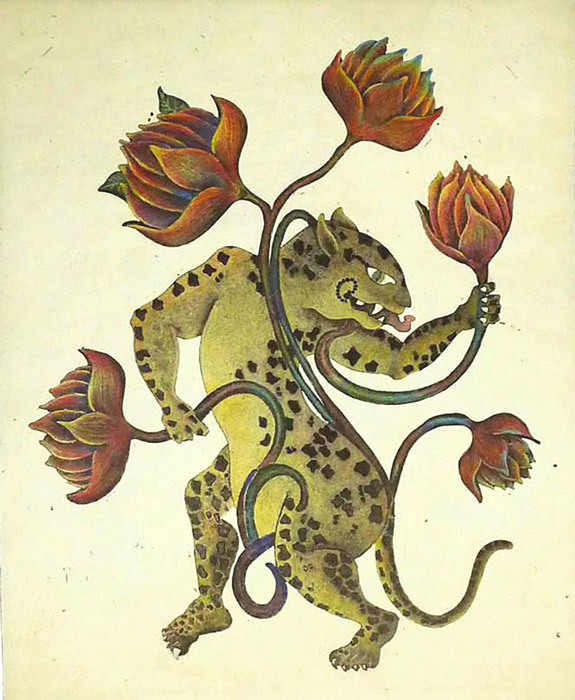 Dancing Jaguar by Alfonso Huerta. Author Carol Karasik weaves together wise retellings of ancient stories based on the latest explorations of hieroglyphic texts and iconography, along with a profound understanding of the oral and written literary tradition of the Maya. She has published a variety of books on Maya culture such as the award-winning “Mayan Threads: A Woven History of Chiapas.” The author is a poet, writer, and editor who has worked on books and films in the fields of anthropology, art, ecology, and educational philosophy. She lives in Chiapas, Mexico. Ms. Karasik continues to introduce audiences to the cosmic vision of the ancient and modern Maya. Mark’s passion for Guatemala started as a Peace Corps volunteer, followed by a career working for eight international organizations including MAP International, Make-A-Wish International, and as the CEO of Hagar, which works with survivors of human trafficking. According to Midwest Review, his book, “Different Latitudes: My Life in the Peace Corps and Beyond,” www.amazon.com/Different-Latitudes-Peace-Corps-Beyond/dp/1935925814 is a story of one man’s physical and spiritual journey of self-discovery through Latin American, African, European and Asian topography, cuisine, politics, and history. 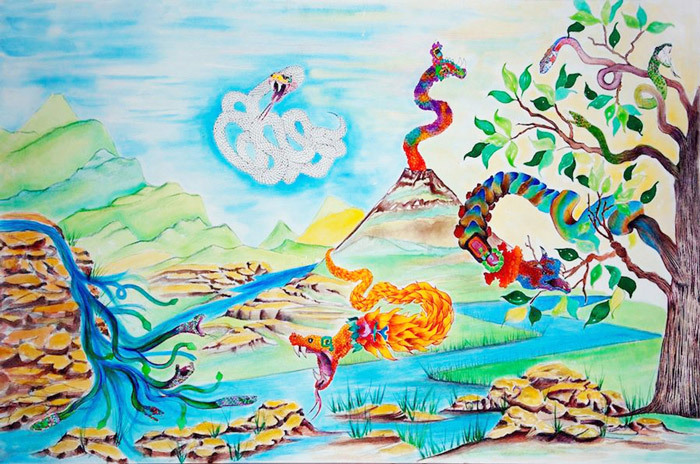 Snake Volcanoes by Alfonso Huerta. His most recent article, “My Life in the Land of the Eternal Spring” ragazine.cc//mark-walker takes place on a coffee plantation in Guatemala and was published by Wising Up Press as part of the Crossing Class: The Invisible Wall anthology. 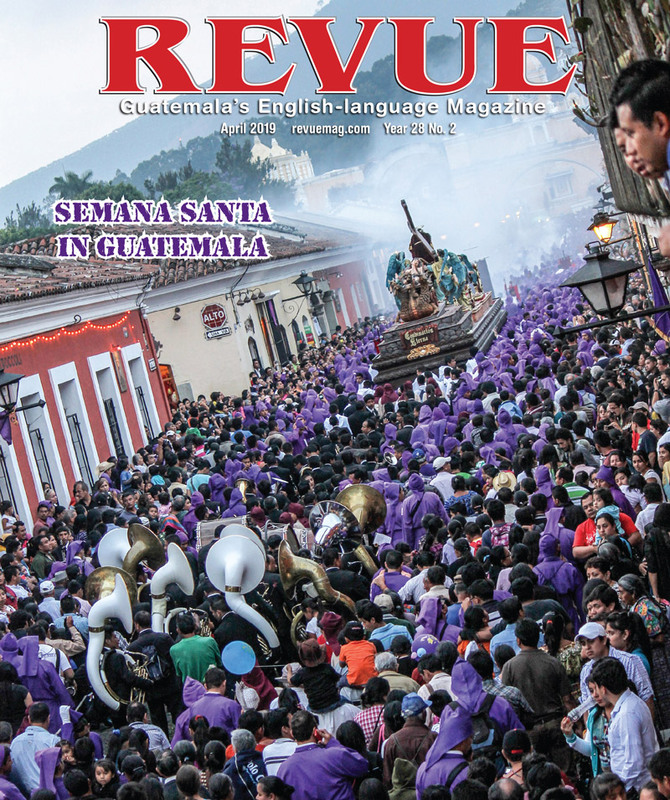 “The Making of the Kingdom of Mescal: An Indian Adult Fairy Tale” revuemag.com/in-the-kingdom-of-mescal was published in the print Revue in April 2018. Mark is a board member of Partnering for Peace and Advance Guatemala and was the recipient of the Service-Above Self Award from Rotary International. His wife and three children were born in Guatemala. Fire Serpent by Alfonso Huerta. The art in this book is incredible! 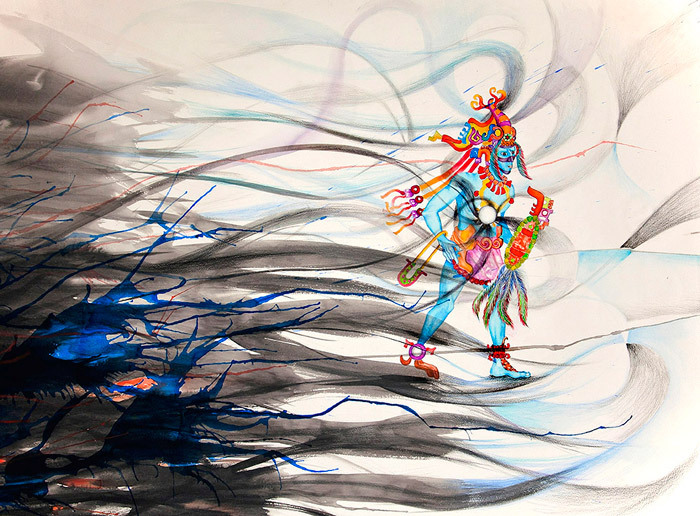 Alfonso Huerta’s work is stunning. Utter perfection. 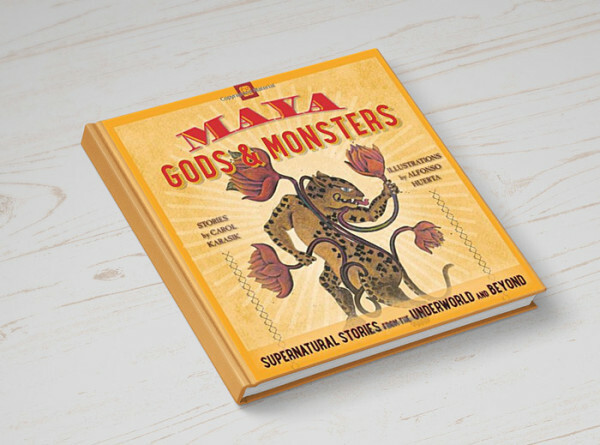 Thank you for publishing Mark Walker’s insightful review of Maya Gods and Monsters, along with Alfonso Huerta’s beautiful illustrations, in your excellent magazine. Some of the tales in this book have been told for at least 2000 years throughout the Maya area. 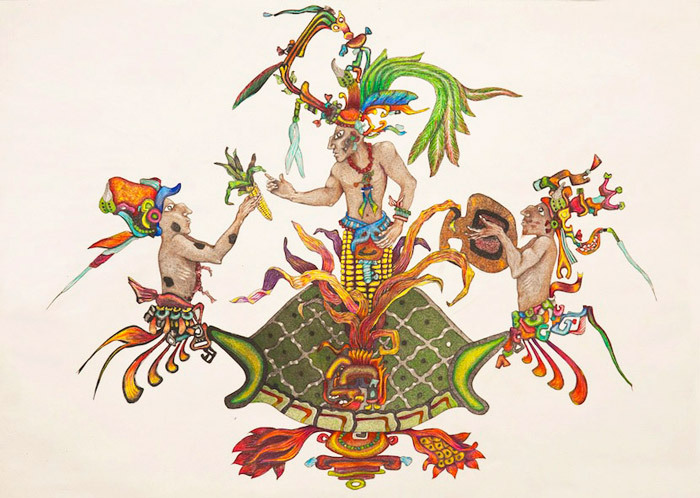 Similarly, Alfonso Huerta’s illustrations capture ancient images and bring the gods to life. Overall, Maya Gods and Monsters is a colorful primer for readers of all ages who are interested in the essence of ancient and modern Maya culture.